3D maximal intensity projection of the foot of a 15-year-old American Quarter Horse mare with severe laminitis. There is moderate increased uptake at the dorsal distal aspect of the hoof wall (short arrow) and marked FDG uptake through the sole (long arrow). This indicates increased metabolic activity in the lamina at the site of rotation and marked inflammation as the toe of the distal phalanx protruded through the sole. Positron emission tomography (PET) scanning technology has been proving its worth in assessing issues in the horse’s foot and the suspensory ligament. The technology has been pioneered by UC Davis in California, which became the first veterinary hospital in the world to install an equine PET scanner in 2016. Since then, there have been more than 85 equine PET studies. Studies include important research projects and the growth of clinical purposes for PET scans to improve equine health through the utilization of the piPET device, a scanner originally developed for neuroimaging studies in non-human primates but found by UC Davis researchers to be quite useful on horse legs. The work has been carried out with support from the UC Davis Center for Equine Health and Brain Biosciences. 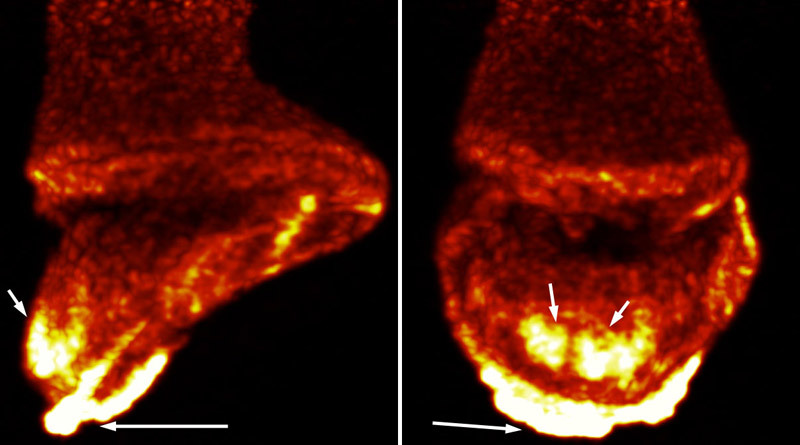 NaF PET and fused PET CT transverse images of the fetlock of a 6-year-old Warmblood horse. There is marked focal increased radiotracer uptake in the lateral proximal sesamoid bone (long arrow) and diffuse moderate increased uptake through the lateral branch of the suspensory ligament (short arrows). This demonstrates an active desmitis of the lateral branch with focal insertional desmopathy. One of this year’s most important achievements was the validation of a dual-tracer scanning protocol, which allows for the assessment of both bone and soft tissue lesions in lame horses. This protocol has now been used on several clinical cases and has been used to assess complex lesions involving the foot and the suspensory ligament. PET has also proven to be an interesting component for laminitis research. Laminitis, as most horse owners know, is an extremely serious condition of the horse foot that, unfortunately, is often fatal. There are still a lot of unknowns on the origin and development of the disease. While researchers continue to investigate the disease, PET has brought new insights on the areas of the foot that are the most affected. PET scanning has brought new insights on the areas of the foot that are the most affected by laminitis. PET also contributed to research in regenerative medicine at UC Davis. Working with veterinarians in the Equine Lameness and Surgery Service, radiologists have been able to label stem cells with PET tracers, allowing to assess their distribution after injection and confirming their location in targeted lesions. Radiologist Dr Mathieu Spriet had extensive experience with tracking stem cell using scintigraphy and has been impressed with the advantages that PET brought. In addition to studies, UC Davis has scanned more than 40 clinical patients, bringing useful information for management of cases. In one case, Irish Streetsinger — a racehorse with persistent lameness — was admitted to UC Davis. Following several lameness evaluations (including radiographs and nuclear scintigraphy to determine the area of lameness), clinicians advised her owner that a PET scan would be the best option to obtain a conclusive diagnosis. The scan pinpointed her lameness, and following stem cell treatment, she was back on the track. In 2018, Irish Streetsinger ran seven races with one victory. “We are seeing a tremendous amount of enthusiasm for the use of PET from the veterinary imaging community,” Spriet said.